Welcome to myHomeVillage.com, a site describing home automation projects to improve energy savings and dweller's well-being using computers, mobile devices, internet, and information services. other applications like keeping the plants alive when the house is closed. This site is continuosly evolving and it aims at colecting scripts that automatically discover the devices in the home, and it enables the user to operate the home using interactive documents describing home operation and maintenance. Most software applications to control the home, in this site, are native in mac computers and they need little configuration by the home users. The home automation implementations consist of integrated systems arranged in interconnected buses for security, automation, energy, and thermoregulation that are all managed by a local computers and several mobile devices located in a Local Area Network (LAN) enriched by the availability of internet services. This site explores how to optimize the dweller’s well being. 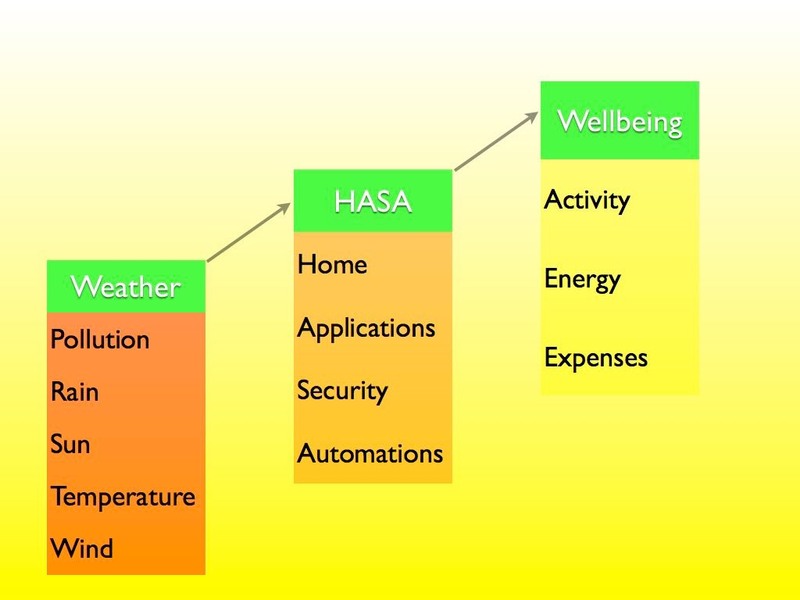 The figure below shows the home as a collection of systems to cope with weather conditions as pollution, rain, sun, temperature and wind to improve the dwelers well being managing people activity, alternative energy, and expenses.